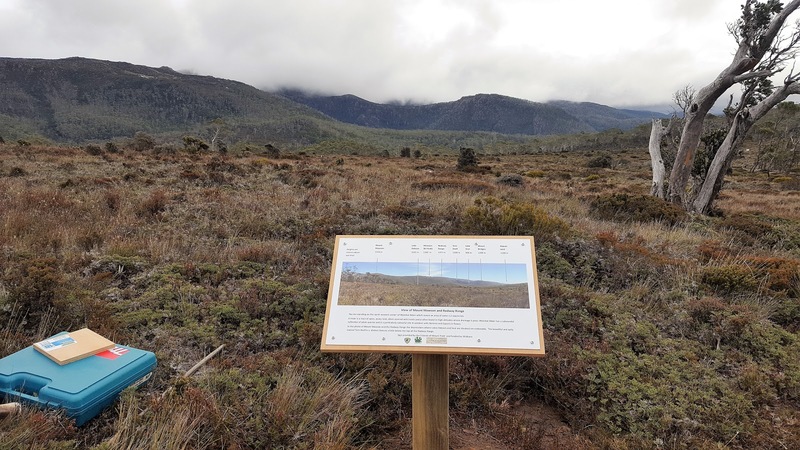 Perhaps the most pressing reason for revisiting Wombat Moor, in the high country at Mount Field, was to replace the buckling boards supporting our flora signs, however we also were keen to put in panorama sign. The panorama sign shows viewers, walking over the early part of the moor to the Woodland Mosaic, the names of the features along Mount Mawson and the Rodway Range. Superb teamwork saw Adrian unscrewing the flora signs whilst soon after Greg and Greg did the replacement of the backing timber; each using a drill for efficiency and smoothness. Trevor in the meantime dug a post hole and installed the panorama sign. Trevor, by the way, is second in charge at the national park we all enjoy working with him and not just because he shouts us a hot drink at the visitor centre café afterwards. On completion, we walked to Seagers Lookout junction to add a “you are here” and another sign before finally adding two information signs to the Pack Track that links the ends to the Mount Field East walk. It was an impressive to watch a group with such teamwork and coordination especially as conditions at this high altitude weren’t exactly balmy.